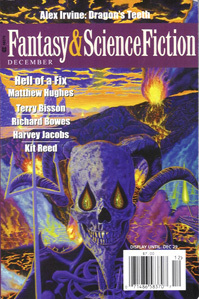 The Magazine of Fantasy & Science Fiction finishes 2009 with an issue of their now standard bi-monthly size, but dated for a single month to enable a clean start in 2010 with a Jan/Feb issue. Irvine’s ‘Wizard Six’ in F&SF June 2007 was a strong and dark fantasy story. In a similar vein, he follows Paulus, of the King’s Guard, as he embarks upon a quest to slay a dragon. But it’s not shining armour and chivalry, but human emotion, betrayal, love and fear. Duncan is a librarian, and according to her blog title, a dilettante – so that’s two things she has in common with me. What we don’t have in common is that one of us can write really good SF. Editor Gordon van Gelder introduces the story by telling us that he was so impressed with the story that he showed it to Ursula Le Guin, who also approved of it, so you start the story with high expectations, which are quickly met, and to be honest, if you had read this story without knowing the authorship, you’d be thinking of one of the leading female writers such as UKLG or Kress, so good is it. The story has a strong female character, who gets a message that leads her to find out a lot about her father, and herself. The background is subtle, eschewing bog-standard settings and culture, set in India, against a muslim society. Furthermore, in visiting an orbiting spaceship recently arrived at Earth, Duncan also provides an intriguing vision of the spacefaring crew, their society, mores, and language. The story uses footnotes to provide further background, which works well as it avoids infodumping in the narrative. It transpires that her father had a relationship with one of the spacefarers during his time studying them, and it is the death of the child of this relationship that has brought a request to arrange a funeral on Earth for her. In finding out about this half-sister she never knew she had, there is a decision to be made as to whether an Earth-bound funeral is indeed appropriate. It’s an excellent story, and worth looking out for – one of the Year’s Bests is bound to feature it. After such a subtle story, Bisson’s humour in constrast feels somewhat clumsy. He has a man and woman finding themselves coming out of suspended animation on a spaceship, not at all clear of who they are and why they are there. It appears that they have been there a long time, and the ship’s AI is feeling the strain. Repopulating the Earth seems to be the task at hand, and to this end the woman is provided with some skimpy underwear to flounce around in. (In ‘Planet of Mystery’ F&SF in Jan and Feb 2006 Bisson has a lead female character parading around in ‘orange underpants’, so Bisson clearly got a thing about scantily clad women). However, Earth is not in need of repopulating, and the Atlantean couple have to find a new role for themselves. Matthew Hughes. Hell of a Fix. Chesney Arnstruther is a cove prone to making exclamations along the lines of ‘Get the blue bling blithers off my table!’ when a demon appears, and ‘What the hepty-doo-dah’s going on?’ when things go pear-shaped and there aren’t any jiggling bosoms from passing female joggers to be enjoyed. Comes across as a bit of douchebag to me, but if you enjoy Hughes’ stories, as many of you do, you’re bound to get full Hughesian value from this contemporary tale. Brendan DuBois. Illusions of Tranquillity. DuBois looks at the likely reality behind having a settlement on the Moon. Behind the glitz that is the public-facing tourist areas, life for those born on the moon is very much a case of ekeing out an existence, with water a valuable commodity, and only the occasional chance to provide a service (ahem) to a tourist from which to profit. Young Eva has such a chance crop up – a tourist wants to meet up with a local, and she obliges, carrying what purports to be a part of an original Apollo 11 moon flag with which to fleece the gullible guy. She’s also wiling to go the extra mile if necessary, but is fortunate to find her tourist doesn’t have that on his mind, and is in fact willing to provide for her much more than through a bit of incoming currency. Kit Reed. The Blight Family Singers. Reed’s first story appeared in F&SF in April 1958, hitting the shelves two years before I was born. Here she takes a wry look at a family who are driven by their mother (quite literally) to seek and maintain their future by performing on the stage. Think of the Osmonds and the Jacksons, only really dysfunctional and with even more overbearing parents. When they come to town, the local school and their students are to varying degrees impressed, but one of the singers wants out. In the end it is his mother who gets out, and gets out a long, long way out. Sarah Thomas. The Economy of Vacuum. Another darker view on the costs of getting into space. Virginia is a guinea-pig, living alone on the moon. Whilst she is quite happy spending her time on her own moonbase, things aren’t going well on Earth. At all. It could be that a lonely, very lonely death awaits her, but several decades after she has given up hope, humanity once again reaches out to space. Unfortunately for her, those who arrive see her as a remnant of the old regime, the old First World who were responsible for the calamity that befell Earth. Not a story to be read if you’re feeling a little down to start with! A Christmas Story that starts out bleak, but springs to light. An elderly widow, still not over the loss of her daughter in infancy, is ekeing out a very solitary living in her house, largely out of contact with the outside world. She’s got to the stage of obsessively collecting stuff, but it is an odd bringing together of this crap that turns her life around, as she finds herself making a christmas tree out of odds and ends, and through this, and a helping touch of christmas spirit, that something magical happens. Herel Jablov finds himself in a time station with a woman called Mae. She is there as she is a political prisoner, serving time in this strange vessel. He has been rescued and taken to it, as a result of his first venture into time travelling. He was successful in setting up time travel, to the extent that the time station and Mae are far into his future, whereas he is in Mae’s past, and is the Herel Jablov. Sullivan follows the relationship between the two, and the tensions which arrive when a third party arrives, and which knocks the delicate balance akimbo. In watching Herel’s reaction to the new visitor, and his rationalisation of the need to remove the perceived threat, we find a darker side to him. In the end he pays a price for his action, with the final irony being that there was never going to be a Herel/Mae hook up. Harvey Jacobs. The Man Who Did Something About It. Colin Kabe spends his time working on automobiles, dreaming of actually being able to make a bigger difference to the world. In the end (of the world) he has an opportunity, as the vessel which has travelled far to remove Earth from the prime real estate location it occupies, requires his technical skills to get it airborne again. Not only does he have this challenge, but also the opportunity for a life beyond his ken. Richard Bowes. I Needs Must, the Policeman Said. A life-threatening illness causes disorientation and disturbing nightmares and strange visitations to Mr. Bowes, through which he is able to revisit some of his past, some of his recurrent nightmares, and reach some kind of understanding and acceptance. It’s a strong story to finish the issue, giving the reader a strong sense of the disorientation and slightly removed sensations during illness and recuperation.